SpotPaltalk Password Recovery recovers Paltalk instant messenger passwords, as well as passwords for AOL, Google, Facebook, MSN, Yahoo and ICQ saved in Paltalk messenger. The passwords are automatically recovered, if they are saved on the local system. SpotPaltalk recovers Paltalk instant messenger passwords, as well as passwords for AOL, Google, Facebook, MSN, Yahoo and ICQ saved in Paltalk messenger. The passwords are automatically recovered, if they are saved on the local system. Paltalk versions are supported including Basic, Paltalk Scene, Premium, SuperIMPlus, Extreme, Deluxe, PalPlus and Plus. Passwords from multiple profiles can be recovered as well as passwords from the Google, Facebook, MSN, Yahoo, ICQ and AIM messengers that are stored by Paltalk. All the mentioned features are provided with a user friendly graphical interface. With SpotPaltalk Password Recovery you can retrieve user names and passwords saved in Paltalk Instant Messenger. 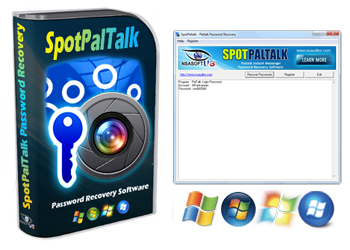 SpotPaltalk Password Recovery Password Recovery is the easiest to use toolkit on the market.